Boccaccio's father was a Tuscan merchant. 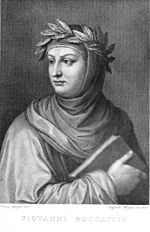 Boccaccio was born in Paris and brought in Florence. His father sent him to Naples to learn about business. The young Boccaccio was drawn to scholarship but became interested in the social life of the commercial and courtly classes. He came to admire Petrarch and fell in love with a beautiful girl, Fiametta. He was called back to Florence by his father. His most famous book, The Decameron, was written between 1348 and 1353 and is regarded as a perfect example of classical Italian prose. The Tuscan language is the parent of modern Italian. The Decameron draws upon the author's own romantic experiences and on his knowledge of commercial life. The stories are based round the experience of ten young people who flea from plague then afflicting Florence. They occupy a villa and tell each other earthly tales of love and sexual intrigue. Boccaccio is regarded as one of the most important figures in European literature and a key influence on renaissance humanism.